In January 2012, New Zealand media highlighted the health issues associated with metal-on-metal hip replacements. But what you might not be aware is of is the material chemistry behind the issue. The metals involved in these hip replacements are cobalt and chromium, normally present in body tissue in tiny quantities (1.2 micrograms and 2 micrograms respectively). The friction from a metal-on-metal hip replacement joint causes metal fragments to wear away into body tissue. 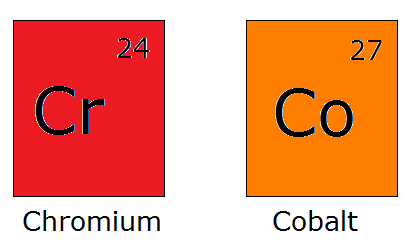 Elevated levels of cobalt are recognised to cause brain tumours, heart irregularities and seizures. Elevated levels of chromium are linked to problems with the reproductive system. Click here for more about cobalt and chromium poisoning. According an February article in the British Medical Journal, these metal ions can cause reactions that destroy muscle and bone, leaving some patients with long-term disability. The metals can leach into the bloodstream and spread to parts of the body such as the liver and kidneys, before being excreted naturally. Britain’s The Telegraph reported on March 7th that a study presented to the British Hip Society conference claims these metal-on-metal hip replacements are responsible for causing cell damage that results in liver and bladder cancer. It also links the elevated level of cobalt and chromium to blood poisoning. In 2010 there was a wide scale recall of the metal-on-metal hip joints. According to New Zealand media (click here to see the online article), over 500 New Zealanders still have one of these artificial joints. These patients are being watched for any signs that their hip replacement is causing health problems. It is clear metals that are going to be inserted in the human body should be chosen carefully to ensure safety. This choice of metals is a form of materials chemistry. But materials chemistry is not only concerned with the nature of medical implants. Done well, it is useful in medicine for other reasons. Things like nanoparticles (particles so small they can be measured with 1 billionth of a metre) are being investigated for potential use in dental fillings. Leading researchers at the University of Otago are studying the antibiotic effects of silver nanoparticles in an effort to create a filling where there will be no associated bacterial activity. Click here to learn more about the research. Materials chemistry is also involved in improving the delivery of pharmaceuticals to disease sites. One of these new drug delivery systems involves stents. Stents are expandable wire mesh cylinders that are inserted into clogged arteries to keep them open and prevent heart attacks. The stents can be coated with drugs, to prevent to formation ons scar tissue around the insertion site, ensuring the artery remains open. It is a very clever way to get a drug exactly where it needs to work. The hip replacement issues raised in January are an example of poor materials chemistry. If synthetic products are going to be inserted into the body, we need to understand what implications this will have for health and also how long-lasting the implants will be. There should be the equivalent of clinical trials for the implants before they are mass marketed. The metal-on-metal hip joint replacements should have been investigated properly before they were mass-marketed. Careful screening of medical devices like these hip joints would prevent bad health effects on unsuspecting patients. British Medical Journal, How safe are metal-on-metal hip implants? February 2012. I am really glad to learn about this because it helps me to increase my knowledge.